In the world of high school football, there were many interesting stories and story lines last week. Schools are getting into the time of year where Homecoming celebrations become a part of the color of the community. Wando had theirs last week. Their top OL (a Florida commit), Nolan Kelleher, was named to the Semper Fidelis All-American Bowl during a pep rally last Friday. However, the team didn't live up to the lofty expectations, losing 36-10 to Summerville, allowing 29 straight after leading 10-7 late in the first quarter. Bluffton was expected to blow out James Island for their homecoming. This wasn't the case. The Trojans had one of their best games of the season, leading 34-21 in the fourth quarter, but they missed an XP that would have made it a two-touchdown game. The Bobcats came back with two quick TDs and XPs to get a 35-34 lead, but James Island drove down to the 30 yard line at the end of the game. They missed a potential game-winning FG, as Bluffton escaped with the 35-34 win. Goose Creek was impressive against a Fort Dorchester team which has potential, winning 49-28 after being tied 7-7 after 1. Stratford also had a nice win against Ashley Ridge, earning a 42-27 W. Berkeley had a bad game against Manning and the wishbone, losing 33-9. Patience is wearing thin in Moncks Corner. My team of the week is West Ashley. After winning just one game last year, they've won their first four games this year. They got a big win over Colleton County, 35-28 last week, but this week, face their toughest opponent of the year so far. Quick picks: North Charleston (0-4, 0-1) at Bishop England (2-2, 1-0) (Thursday): Another region game on Daniel Island, as Bishop England hopes to impress the television viewers. Beaufort (4-0) at Carolina Forest (1-4): A 4-0 Beaufort team that has really flown under the radar heads to Myrtle Beach to face a Carolina Forest team who upset Myrtle Beach last week. Beaufort goes to Goose Creek next week. Wilson Hall (4-0) at Porter-Gaud (2-3): Porter-Gaud plays in an important SCISA game in West Ashley against Wilson Hall, who has blown out their first four opponents. QB Steven Duncan of the Cyclones (only a sophomore) is already one of the best QBs in the area. Cane Bay (0-4) at Ashley Ridge (0-4): This battle of 0-4 teams is big because the winner of this one will gain some momentum to use for region play. Stratford (4-0) at Colleton County (1-3): Colleton County has a chance to impress its home fans again, but Stratford will be a very tough opponent. QB Jacob Park, who likes to draw, has thrown for over 1,200 yards this year, and continues his ascent as the top QB in the state. Top games: 5. Wando (2-3) at Fort Dorchester (2-2) (Channel 2 game of the week): This game is the ultimate PROVE IT game. Both are on two game losing streaks. Fort Dorchester has lost to Stratford and Goose Creek the last two weeks, while Wando has lost to Colleton County and Summerville. You have to think the pressure will be on Fort Dorchester for their homecoming. The rabid Patriots fans will want to see a win. Wando lost just twice last year in 12 games. They've already lost three times this year. 4. Bluffton (4-1) at Hilton Head (4-0): This is a huge game in Beaufort County. The area has had a renaissance this year. Bluffton has been good almost every year since they split up from Hilton Head, and has become hated by many in the Lowcountry. Hilton Head has come a long way. They haven't faced tough competition like Bluffton though so far this year. Bluffton has several good players, like Shameik Blackshear, one of the top DEs in the nation, a South Carolina commit. Hilton Head has improved under new coach BJ Payne. The battle of Highway 278 will come down to the end most likely. 3. Timberland (3-1) at Berkeley (1-3): A huge game for Jeff Cruce and the Berkeley Stags this week. Timberland has beaten Berkeley two of the last three years, and last year, it took an almost unfathomable ten Timberland turnovers for Berkeley to escape St. Stephen with a one point win. This is one of the bigger rivalry games in the Lowcountry; and Berkeley needs a win in the worst way heading into a short week with a Thursday night battle next week. People say Timberland is in a "rebuilding" year, but with Art Craig, one of the best coaches in the state at the helm, he finds the next players up to achieve the job. This has been the case this year. Timberland has an extra week to prepare for one of their biggest rivals. Will it equal a win? 2. West Ashley (4-0) at Summerville (3-1): Very few people thought that West Ashley would be undefeated at this time. Even though they have only beaten two 4A opponents (Ashley Ridge and Colleton County), they have done so in a big way. They led the entire game over Colleton County, and played very well against Ashley Ridge. For Summerville, all their home games are big nights at John McKissick Field. Most fans expect to see a big win for the Green Wave. This year may be different. West Ashley has some skill players which they have rarely had since the splitting up of Middleton and St. Andrews. Pedro Manigault has been a capable field general for the Wildcats. Bobby Ruff ran a huge fake punt for a TD last week to lead West Ashley to a win. Can the Wildcats spring the upset in Summerville? There's a chance. 1. Dutch Fork (4-0) at Goose Creek (4-0): This could very well be the biggest game in state this week. In both state rankings, Dutch Fork and Goose Creek are within the top five. 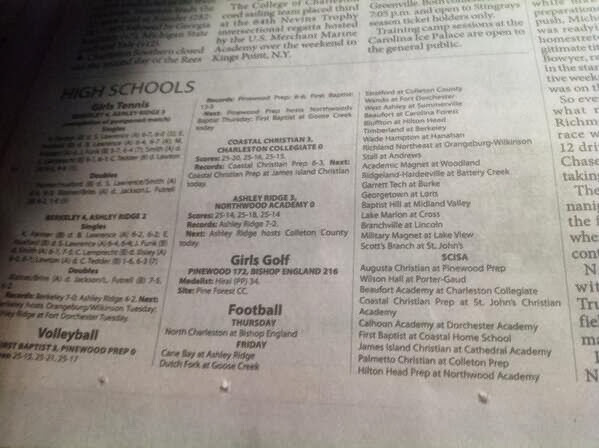 Dutch Fork is the top team in the Columbia area; they face the top team in the Charleston area, Goose Creek. Last week, their RB, Matt Colburn, ran for 286 yards and five TDs against Dorman. That's no easy feat. They also have a very good senior QB in Derek Olenchuk, who has thrown 13 TDs this year. Goose Creek had a tough time with Fort Dorchester early last week. Against a well-coached team like Tom Knotts and Dutch Fork, they'll have to be more careful in order to avoid a tough loss. The game is at John Fulmer Field, a place where they haven't lost to an in-state team on the field since 2010 against Northwestern. This will be a battle that will go down to the final minutes.